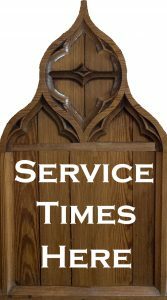 Sunday Mass Times: 8.00 a.m. and the Parish Mass at 10.00 a.m. Morning & Evening Prayer will be said each day in Church at 9.00 a.m. and 6.00 p.m.
with the washing of feet followed by Watch of Prayer at the Altar of Repose until midnight. Activities for children, including Stations of the Cross & building of the Easter Garden. 3.00 p.m. Liturgy of Our Lord’s Passion – including Holy Communion and Stations of the Cross.